Well I say, no more intimidation. No more avoiding that oddly shaped workout contraption or gadget. No more fear of using it wrong. I’m here to help you solve all those deep dark fitness mysteries. This week I demystify the BOSU (which stands for BOth Sides Up because you can use it with either side up.) It’s that whoseywhatsitthingy that looks like a stability ball that’s been chopped in half and then had a platform glued to the bottom. You’ve seen it. You’ve wondered about it. You’ve wanted to try using it but didn’t know how. So you wanna know what to do with that thing? Watch and learn. 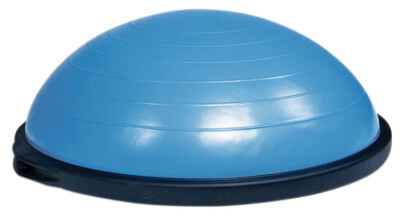 If you’ve got more ideas on how to use the BOSU, by all means enlighten me. Shoot me a note or a short video of your own on Twitter Instagram (here or here) or on Facebook.